This Pesto Salmon was sponsored by California Walnuts. As always, all opinions are my own. This Baked Pesto Salmon recipe is our favorite simple yet elegant seafood dinner. 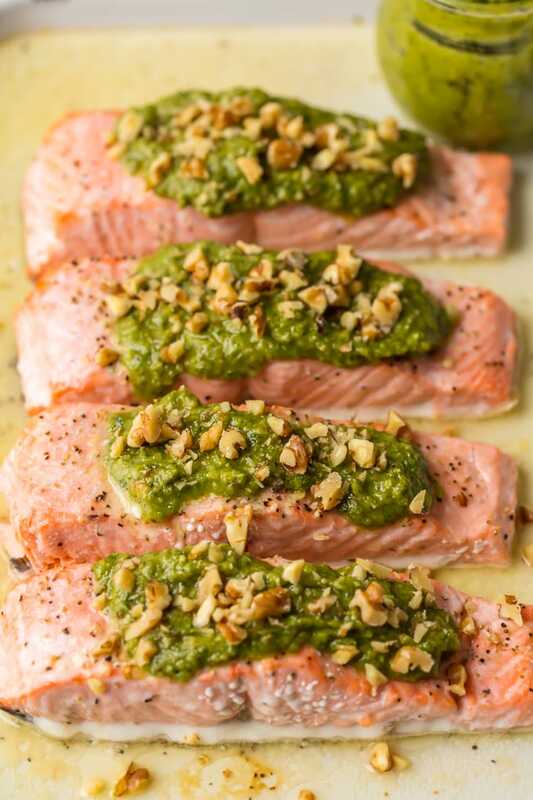 This Baked Salmon Recipe with Basil Walnut Pesto is bursting with flavor and good fat. 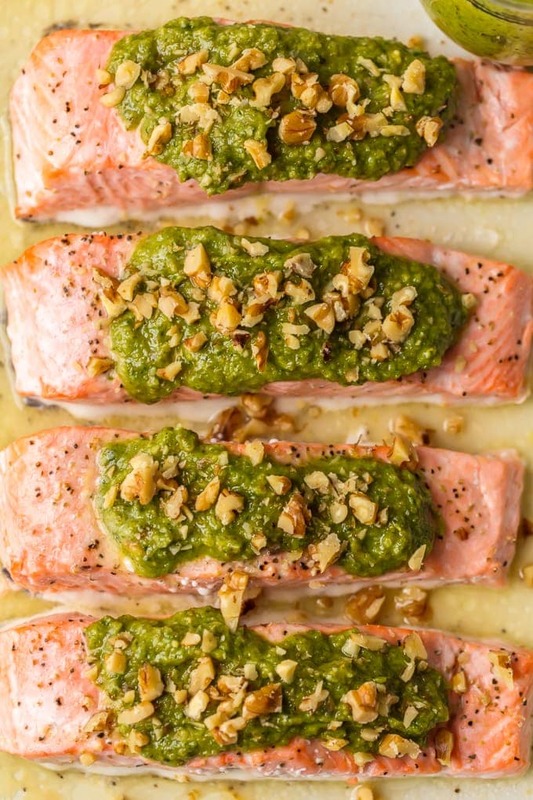 The tender flaky salmon is basted in butter, white wine, and lemon juice before baking and then topped with an amazing nutty and rich Basil Walnut Pesto. 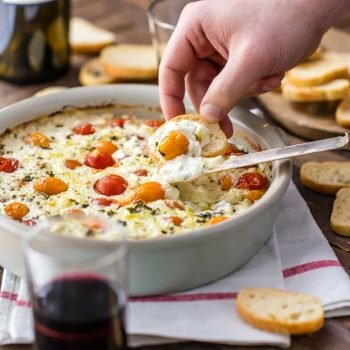 Best Baked Salmon Recipe ever! 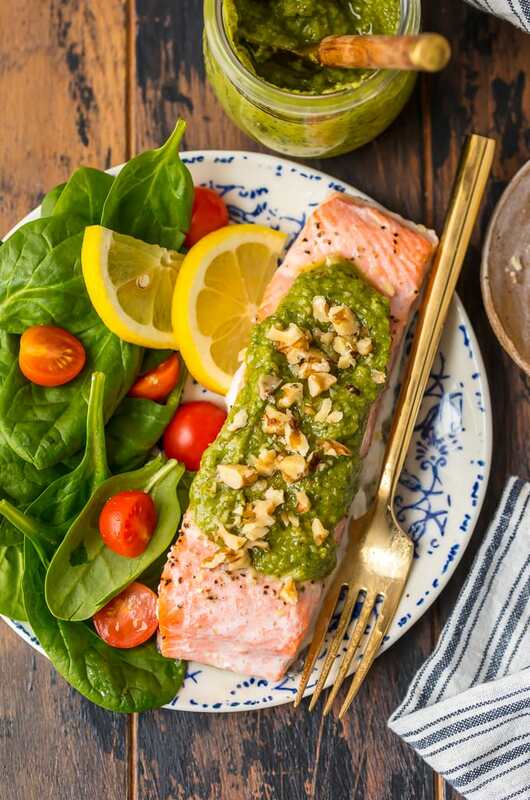 This Baked Pesto Salmon recipe with Basil Walnut Pesto is a heart healthy dinner made in under 20 minutes. The BEST baked salmon recipe ever! 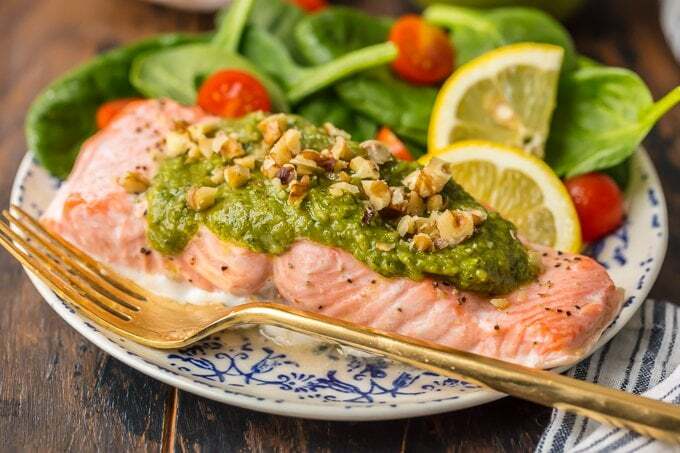 Baked Salmon with Basil Walnut Pesto is one of our new favorite healthy seafood dinners. Pat is always begging me to do more healthy recipes, requesting I make recipes like our Grilled Salmon with Avocado Salsa, Cilantro Lime Shrimp Scampi, Bang Bang Shrimp, and Weight Watchers Lasagna again and again. This Baked Pesto Salmon recipe is next in the rotation to be one of our go-to healthy recipes. I might just give up decadent recipes after all. Salmon is an absolutely amazing fish with so much healthy fat. Mixed with this delicious Basil Walnut Pesto, you’re sure to love this good for you seafood feast. SO MUCH FLAVOR, made in under 20 minutes, and only one pan to clean. Is this heaven? You’re going to love this delicious Baked Pesto Salmon Recipe! 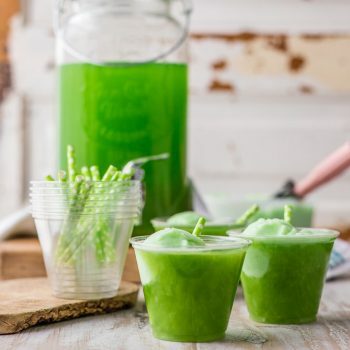 It’s healthy, easy, and so tasty! This Baked Pesto Salmon is full of flavor and so simple. It’s an easy seafood recipe we love to make again and again. We used the ultimate Baked Salmon Recipe for the base of this delicious meal. It’s the best and most fool-proof way I know to prepare salmon. For the Basil Walnut Pesto, I simply layered the ingredients in a high powered blender and let it do its work. SO EASY! We save the extra pesto to put on everything from toasted bread to steak and chicken. Delicious! This baked salmon recipe with pesto is SO easy to make. What’s better than a HEALTHY dinner that’s EASY? Nothing…Just prepare the pesto and then the rest of the recipe will only take about 20 minutes. So you have an amazing salmon recipe ready for dinner! Preheat the oven and place the salmon on a prepared baking sheet. Combine butter, white wine, and lemon juice in a small bowl, then pour it over the salmon. Bake salmon for 12-15 minutes at 350°F. While the salmon is cooking, make the basil walnut pesto. When the salmon is done, top it with the pesto and chopped walnuts and enjoy! 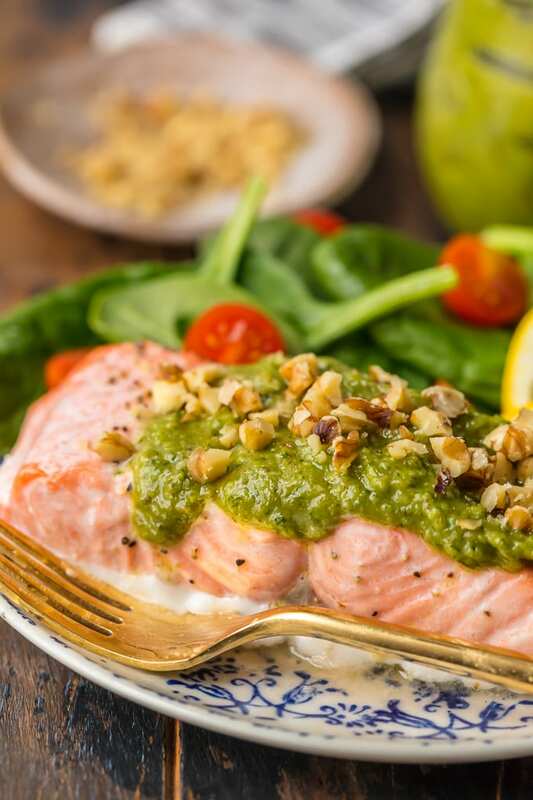 Baked Salmon with Basil Walnut Pesto is a heart healthy meal you can feel great about feeding your family. 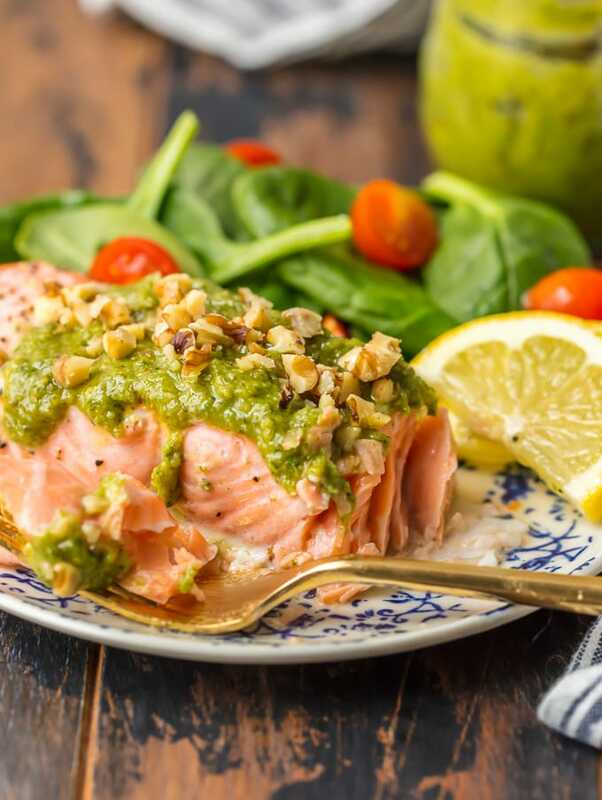 This Pesto Salmon recipe wouldn’t be complete without the Basil Walnut Pesto, and the pesto wouldn’t be complete without WALNUTS! Talk about DELICIOUS! I’m so excited to be partnering with California Walnuts this year, and this heart healthy salmon recipe is the 4th of my 6 recipes. Did you know just 1 ounce of walnuts is packed with 4 grams of protein, 2 grams of fiber, and 2.5 grams of plant based omega alpha-linolenic acid (Walnuts are the only nut that contain significant amounts of this beneficial nutrient!). Walnuts add such dimension and nutrition to any dish they’re added to. In this Pesto salmon they’re blended into the pesto and also chopped and sprinkled onto the top as garnish. The rich nutty flavor and subtle crunch are the perfect complement to the flaky and tender salmon. YUM! A common misconception when eating healthy is that all fat is bad. Your body needs “good fat” to run and good fat is actually quite nutritious! 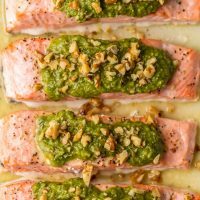 This Pesto Salmon has all the right kinds of fat thanks to the Salmon, olive oil, and of course, walnuts! What is the internal temperature for baked salmon? The USDA recommends an internal temperature of 145°F for Baked Salmon, but it is safe to eat as low as 125°F. I prefer my salmon cooked to 130-135°F. Use an internal thermometer to check the fish at the thickest part of the fillet. Typically, when the fat starts baking out of the salmon and the skin becomes pink/white, you’re good to go. Can you grill the salmon instead of baking? If so, how long do you grill? Yes, you can grill the salmon for this recipe instead of baking! If you prefer grilled salmon, you can use an electric grill for 5-7 minutes per side or until cooked through. That’s also a delicious way to cook salmon. Just make sure use the pesto for this salmon and you’ll get the same amazing flavor! What are some good side dishes for Pesto Salmon? Since this baked pesto salmon recipe is nice and healthy, I like to keep my sides healthy too. Everything from a simple salad recipe to herb roasted potatoes are amazing with this easy baked salmon. Some other ideas are Lemon Butter Grilled Asparagus, Roasted Lemon Parmesan Broccoli, or Mandarin Orange Salad. It pairs beautifully with white wine as well…if you were wondering. How do you make Walnut Basil Pesto? We’ve got you covered with a full post devoted to this DELICIOUS sauce that you can pair with anything and everything…veggies/steak/chicken/pasta/ANYTHING! Walnut Basil Pesto is great on this Salmon and great from a spoon. Be sure to check out the link in the recipe card. See the recipe card below for full details on how to make Baked Pesto Salmon. Enjoy! Looking for more Salmon Recipes? Check out these faves! Preheat oven to 350F. Brush a baking sheet with oil or spray with nonstick spray. Place the salmon on the baking sheet. In a small bowl, mix together the melted butter, white wine, and lemon juice. Pour the butter mixture evenly over the salmon. Bake for 12-15 minutes or until the salmon flakes easily with a fork and is cooked through. When salmon is cooked through, top with a tablespoon of the pesto mixture and garnish with chopped walnuts. Serve immediately. Enjoy! Wow, Bec. This looks so delicious. I have Pesto in the fridge and will have to fix it for supper next week. YUM!!! Thanks! You guys would love it. So much flavor. Ok, so I wasn’t a salmon fan until THIS! Holy smokes… amazing! Basil Pesto makes everything taste so good!! The salmon looks so tender! Got to try this! Basil pesto on everything please! This is my all time favorite way to cook salmon! MMMM I love some grilled salmon in the summer time! Can’t wait to try! Yesss, I’m already dreaming of salmon dinners on the patio this summer.